Life may not be perfect, but your hair can be! Dubai, UAE, April 25, 2018: Shop counters stacked with numerous products for hair pose a huge dilemma for consumers who are out there in the hope of getting the best product for their hair. Brands will do well if their products could address simple consumer questions such as what's the best shampoo for my hair, how can I prevent my hair from breaking, how can I nourish my hair and avoid it being dry, etc. Successful brands give consumers what they want, and what they want is healthy hair. Most shampoos have detergents in them that instantly strip hair of oil and colour leaving them dry and frizzy which leads to breakage. One’s best bet would be a shampoo that has proteins in it to strengthen and revive hair. However, hair needs more care and attention to keep it healthy and nourished, hence the need for more than one product. There are few essential products for hair, each one with a unique purpose, but we should be careful to choose a brand that’s committed to not using nasties such as sulfates, parabens, phthalates, gluten and drying alcohol. 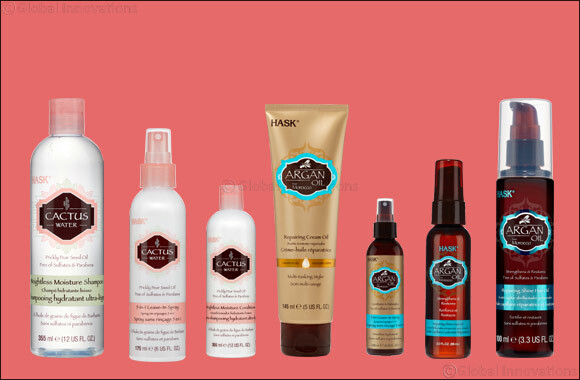 HASK is one brand that produces an exceptional set of hair care products that have exotic oils and other unique ingredients from around the world. The range includes shampoos, conditioners, deep conditioners, shine oils, dry shampoos and stylers based on the key ingredients of Argan Oil, Cactus Water, Monoi Coconut Oil, Coconut Water, Keratin Protein and Macadamia Oil to name a few. HASK shampoos, conditioners and shine oils are free of sulfates, parabens, phthalates and gluten. Each system was developed to target and solve specific hair care needs. On the outside it may be prickly, but on the inside the cactus plant is known for its ability to retain large amount of water and nutrients. HASK has bottled up this hair holy grail with prickly pear seed oil to create an ultra-nourishing and hydrating collection: HASK Cactus Water Weightless Moisture collection. With 5 naturally occurring electrolytes, vitamins A, B and C, and minerals with rare antioxidants, Cactus Water moisturizes hair leaving it feeling soft and shiny without weighing it down. Perfect for fine or oily hair, the cactus water collection keeps hair hydrated all day without excess oil or build-up. Quenching thirsty strands with nutrient-rich cactus water and prickly pear seed oil, dehydrated hair is revived and luminous. Complete with a Weightless Moisture Shampoo (AED 29), Conditioner (AED 29), and 5-in-1 Leave-in Spray (AED 32), the Cactus Water collection brings dull hair back to life by conditioning, repairing, and adding shine. Thirsty strands craving some much-needed hydration? Powerfully packed with good-for-you electrolytes and antioxidants, Coconut water is known for its ability to replenish and recharge. HASK has bottled up all the nourishing properties of this natural powerhouse to create the HASK Coconut Water Weightless Volume collection. Perfect for fine or oily hair that falls flat easily, this clear collection keeps strands nourished without excess oil or build up. Rich in Vitamin K and Ginseng, the Coconut Water formula keeps hair soft, healthy and bouncy by leaving it clean and light. It strips away residue without stripping away moisture and allows for hair that is nourished and replenished for a silky, voluminous finish. The collection includes the Weightless Volume Shampoo (AED 29) and Conditioner (AED 29). Revive and restore the look of your hair with the Argan Oil collection featuring a range of products derived from the nourishing “miracle oil”, a timeless beauty secret of its native Morocco. Infused with high-absorbing moisturizing and split-end repairing qualities, Argan oil penetrates the hair shaft to leave even the most rebellious locks frizz-free, silky-soft and super glossy.